Like many people I'm often asked, what did I do on the weekend? Quite often the answer is "I went on a photo walk". For those of you wondering what a photo walk is, it is a person or group of individuals getting together at a set location and time for the purpose of taking photos along a specified route. I quite often go on solo walks, but I have also organised or participated in organising walks from 1 to approximately 300 photographers. The World Wide Walk run by Scott Kelby a USA based photographer and author runs once a year; in 2014 this walk had over 20,000 participants participating in over 1,000 walks within 24 hours all around the world. Some walk organisers want to claim copyright over all images taken during the walk, I personally would avoid these. Some walk organisers want payment. This is fine if the walk is combined with being taught a new technique or someone is imparting specialist knowledge, but I would do it only if you will be part of an extremely small group. But bear in mind many walks are free and most photographers I know are happy to assist in improving fellow walker’s knowledge and skills. I’m a moderator in two Google Plus communities (Melbourne Photowalkers and Olympus Friends Australia), these communities runs free walks and new members are always welcome. I’ve also participated in Meetup walks and most of these are free. Check weather forecasts and be prepared for the expected weather (where I live, Melbourne, layers can come in handy), use sunscreen even on an overcast day, a drink bottle in warm weather is useful. Equipment used can range from a phone to medium format with one or more lenses, tripod and other accessories. Bear in mind the more you carry the less inclined you will be to use it especially after carrying it for a couple of hours. If you want to geocode your images apps like My Tracks for Android or similar apps for iOS devices are useful. I usually like to have way points to allow people to join part way through a walk, foster the social aspect of the walk and allow slow walkers to catch up with the faster walkers. It’s also great to have a spot at the end of the walk where participants can get together over food and drink and compare notes, chat about gear, interests and generally get to know each other. I usually arrange for the start and end point to be the same location to make transport arrangements easier. Allow approximately 1 hour/kilometre (some will always spend an inordinate amount of time photographing what appears to most a mundane object or location). You should aim for a duration of approximately 2 to 3 hrs. longer than this and it will take a long time to get the group back together at the end. If you are organising a walk sometimes it is useful to have a theme, such as a limit on the number of images taken, monochrome, macro, architecture, street art etc. Social media platforms allow you to advertise the walk, publish route information and track the number of participants. My preferred platform is Google Plus due to its ability to set up events, ease of incorporating maps, checking expected numbers and the way it handles images posted by participants. The terms and conditions covering image copyright are also better than platforms such as Flickr, Instagram or Facebook. Most of all I hope you enjoy the experience. I love the street art in inner city Melbourne and one of my favourite artists is RONE. His Lumen Exhibition is on in Melbourne until the 9th of November. 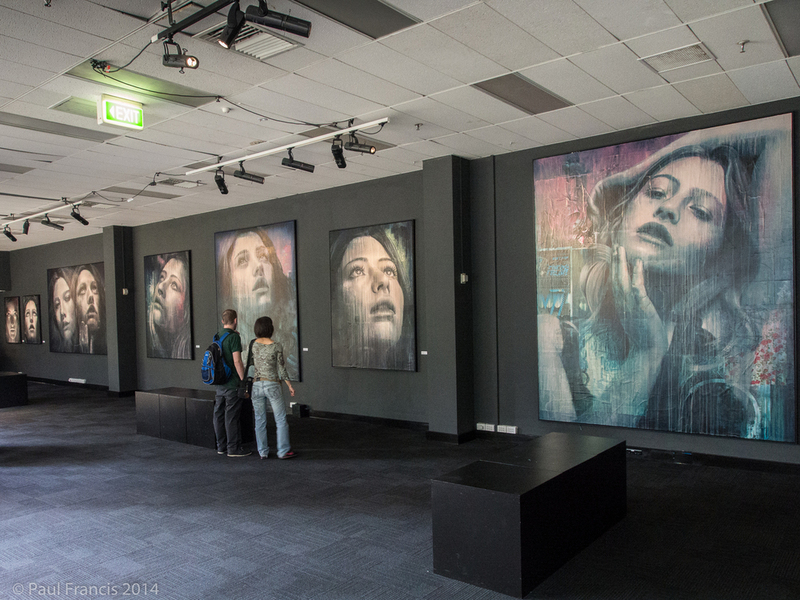 I dropped in to see the exhibition last weekend and was lucky enough to have a great chat to RONE, especially about how all his works have a limited lifespan. The exhibition consists of several images inside, as well as images using surrounding external walls. See some more of RONE's work below.